We are studying in Luke on Sunday mornings and this word for Jesus really struck me this week. I have never really given it much thought, having read over it numerous times. Just another example of the Word being alive, and seeking to teach us different things from the Word at different seasons of life. 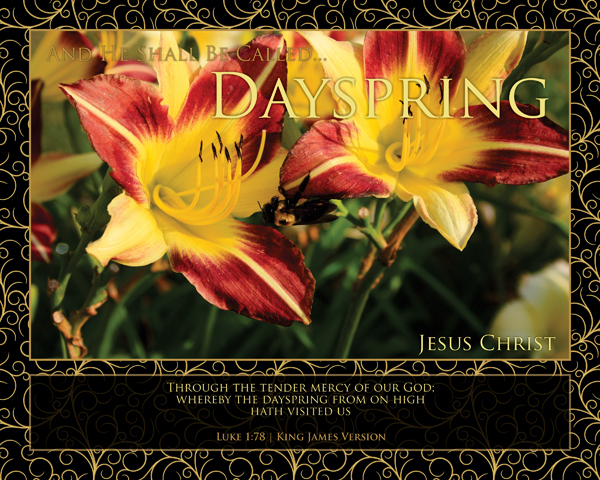 Jesus is that Dayspring. I have a new Bible that has Greek and Hebrew translations in it. I am just loving the word study with it. I searched and found this great article from Henry M. Morris, another of my Bibles includes his commentary. This is an unusual, but beautiful, name of the coming Savior given Him by Zacharias when he was "filled with the Holy Ghost, and prophesied" (Luke 1:67). In that same prophecy, Zacharias also called that coming one "the Highest" and "the Lord" who would "give knowledge of salvation unto his people by the remission of their sins" (vv. 76-77). Just six months later, Jesus was born. The Greek word here translated "dayspring" is so translated only this one time. It refers to the metaphorical spring from which the sun springs forth each day, and so is usually translated simply as "the east." It is interesting that it is used three times in connection with the story of the wise men "from the east" who saw "his star in the east" and then, when they reached Bethlehem once again, "the star, which they saw in the east," led them to the one who was Himself "the dayspring" (Matthew 2:1-2, 9).